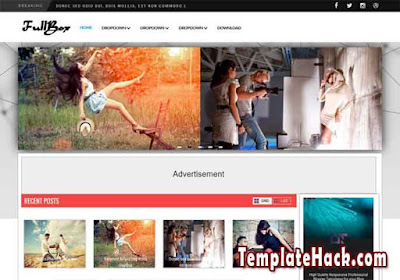 TemplateHack.com - Download Fullbox Responsive premium blogger template. Fullbox is magazine blogger template with elegant design. Featured post will show your 2 latests post on your blog to make your latest post more showable. Like the name, Fullbox, this template is made with full box style. No circle design, no triangle, and no other shape except box. Fullbox is a great blogger template and you can downloat it for free. Free premium blogger template. Ads Ready, Breadcrumbs, Drop Down Menu, Featured Post, HTML5 Valid, Page Navigation Menu, Post Thumbnails, Responsive, SEO Friendly, Social Bookmark Ready, Social Share Button, Whatsapp Sharing Button, Elegant, 1 Right Sidebar, red, 2 Columns, 3 Columns Footer. Anime blogger template, Download blogger template, Film blogger template, Gadget blogger template, Games blogger template, Gallery blogger template, Magazine blogger template, Movie blogger template, News blogger template, Newspaper blogger template, Photo blogger template, Sports blogger template, Tech blogger template, Technology blogger template.